Tiger is one round into the Hero World Challenge and he looks healthy. And just for a moment there looked downright awesome! There it is! 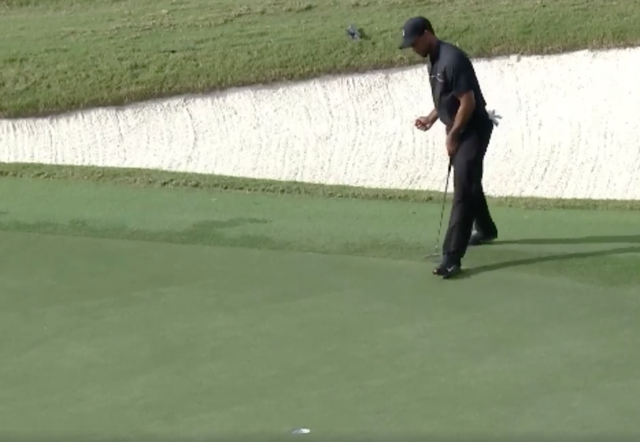 Tiger Woods first fist pump back! This hadn't the air of a forced return and there was no wincing. Woods played the front nine masterfully and though he did fade and struggle to hit fairways betimes there were enough gritty par saves to take big positives from his first day back at work. Woods signed for a 73, 17th of the 18 man field but that doesn't tell the story. Here are the Tiger dominated highlights. Woods swing speed had been the subject of much debate. Here's a compilation of just his drives from yesterday. They didn't all go straight, but the speed was there. There was even a fist pump following a par save after all sorts of trouble in the sandy waste area and a bunker. Even Hank Haney was backfilling the hole!